Jamie Foxx to Star in Spawn | Nerd Much? The Spawn reboot has landed its leading man. 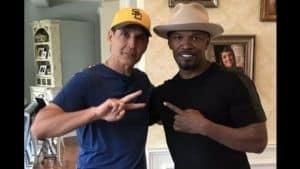 Deadline is reporting that Jamie Foxx is now officially set to star in the upcoming adaptation. Foxx said that he was “aggressively pursuing” the role back in July of 2013. His perseverance has apparently paid off. Even though the franchise is probably luckier to have the star than he is to have it. The film will mark the directorial debut of the character’s creator, Todd McFarlane. McFarlane created Spawn for Image Comics in 1992. Born Albert Francis “Al” Simmons, Al was a member of a CIA black ops team before being betrayed by members of his squad. He was murdered and sent to hell due to Simmons knowingly killing innocent people. In hell, Simmons made a deal with the evil being known as Malebolgia. In exchange for his soul, Simmons would get to see his wife again. Backstabbed again, Simmons was sent to Earth 5 years later but in the form of a demonic hellspawn with little memory of his past life. Upon recollection of his memories, he found his wife had remarried his best friend, sending the enraged Simmons on the path to become the antihero Spawn. It apparently took some time write, as McFarlane announced in February 2016 that the script was completed. In July 2017 Blumhouse Productions announced they would be involved with production to begin in February 2018. Things were apparently sidetracked a bit, but the casting of Foxx makes it seem as though things are back on track. There’s no word from Blumhouse or McFarlane as to when they hope to get Spawn back into theaters.